I ignore number one and add 177, namely, visit library and pay fines. 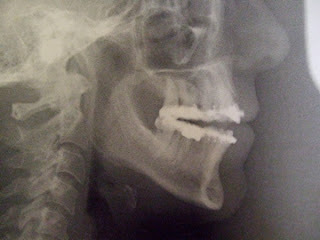 Soon I will have jaw surgery. This will finalise my transformation into a true American. It took the dentist 7 years to persuade me that this was a 'must,' not an optional extra. Three visits 'home' convinced me. It's a genetic thing. Teeth that don't join anywhere. This means that you swallow your food whole. This means that you get a lot of tummy aches. People think that I am an exceptionally polite person, because I eat everything with a knife and fork. People do not see useless teeth that do not join, because I also have a genetic stiff upper lip. “Hi Maddy! How's the nanny search going?” says the Muse. Her cheery tone is not appreciated but as it is 9:05 a.m. she knows that I won't bark at her. “I forget.” She's a kindly soul and doesn't point out that we both know that I am lying. Damn the woman. She's fired. Posted on January 5th, 2007.